Difference between revisions of "Martin Oberhuber"
Martin is the leader of the [[DSDP/TM|DSDP - Target Management project]], DSDP and Eclipse PMC member, platform-core and [[e4/Resources]] committer, and currently chair of the Eclipse [[Architecture Council]] (EAC). He's been working for [http://www.windriver.com Wind River] in Salzburg, Austria since 1998, mostly focused on the [http://www.windriver.com/portal/server.pt?space=CommunityPage&spaceID=4&in_hi_userid=27106&control=SetCommunity&PageID=0&CommunityID=397& WR Workbench] product. Driven by his desire for constant improvement, he is involved in many areas around Eclipse and Open Source, particularly [http://www.jcraft.com/jsch JSch], [http://www.rxtx.org RXTX], and [http://commons.apache.org/net Apache Commons]. His many interests have made him fluent in more than 10 programming languages including C++, GNU/Linux technology, source parsing and hardware-near programming. 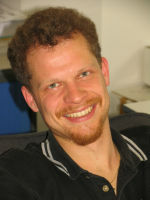 Martin holds a Master of Engineering degree in Telematics from the [http://www.tugraz.at University of Technology Graz]/Austria, and is a [http://www.scrumalliance.org/profiles/57642-martin-oberhuber certified ScrumMaster]. Martin is the leader of the [[TM|Eclipse Target Management project]], Eclipse PMC member, platform and [[e4/Resources]] committer, and currently chair of the Eclipse [[Architecture Council]] (EAC). He's been working for [http://www.windriver.com Wind River] in Salzburg, Austria since 1998, mostly focused on the [http://www.windriver.com/portal/server.pt?space=CommunityPage&spaceID=4&in_hi_userid=27106&control=SetCommunity&PageID=0&CommunityID=397& WR Workbench] product. Driven by his desire for constant improvement, he is involved in many areas around Eclipse and Open Source, particularly [http://www.jcraft.com/jsch JSch], [http://www.rxtx.org RXTX], and [http://commons.apache.org/net Apache Commons]. His many interests have made him fluent in more than 10 programming languages including C++, GNU/Linux technology, source parsing and hardware-near programming. Martin holds a Master of Engineering degree in Telematics from the [http://www.tugraz.at University of Technology Graz]/Austria, and is a [http://www.scrumalliance.org/profiles/57642-martin-oberhuber certified ScrumMaster]. Martin is the leader of the Eclipse Target Management project, Eclipse PMC member, platform and e4/Resources committer, and currently chair of the Eclipse Architecture Council (EAC). He's been working for Wind River in Salzburg, Austria since 1998, mostly focused on the WR Workbench product. Driven by his desire for constant improvement, he is involved in many areas around Eclipse and Open Source, particularly JSch, RXTX, and Apache Commons. His many interests have made him fluent in more than 10 programming languages including C++, GNU/Linux technology, source parsing and hardware-near programming. Martin holds a Master of Engineering degree in Telematics from the University of Technology Graz/Austria, and is a certified ScrumMaster.